Today I decided to cook lunch, rather than do take out. Besides I’m on a tight budget and all that I had in the freezer was ground beef, turkey burger patties, frozen fruit (strawberries, raspberries, blueberries, mangos, pineapple, peaches) and chicken. I went with the chicken, thawed out a few strawberries, pulled fresh spinach from the fridge that I bought last night and mixed up a balsamic vinegarett and tah-dahhh! Lunch is served and the fam is looking at me like I’m a winner. Normally, I’d grill the chicken on my George Foreman Grill, but being that I’ve loaned it out & it hasn’t returned, I had to rely on baking the chicken. I seasoned it first then baked it for 30 minutes at 350 degrees then in a cast iron grill pan I added the grilled lines for aesthetic purposes – to make it look good. Then in a mason jar I mixed the olive oil, parcely, garlic, salt and pepper. I placed the lid on the mason jar tightly & shook the contents up for about 20 seconds or so. 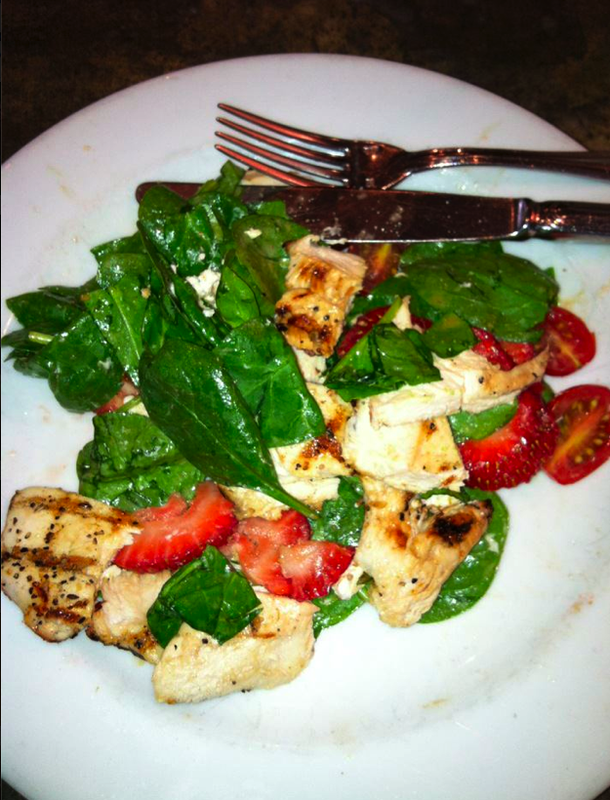 I then dressed my plate with spinach leaves and strawberries, added the chicken and balsamic dressing and wahlah! Lunch was served. this recipe serves 4. The health benefits of spinach, flaxseeds, strawberries and olive oil boost your antioxidant levels (which builds up your immune system), yields you iron fights off free radicals (known to convey cancers), [the flaxseeds] reduce belly fat, and the olive oil helps your skin, hair and digestive system. This meal is a win-win and one you should have as often as possible. it leaves you satisfied minus the bloat & tiredness you get from fast foods as your stomach fights to process its over processed ingredients. You nor your stomach deserve the benefits of fast foods — so avoid them as much as possible. And now that we’ve eaten, I’m feeling real good. I think I’ll take a brisk walk through my hood. My tummy is happy — and that is a fact. And thanks to my diet — my tummy’s getting flat. Hey-ey! You know I love that. Serving up the good — ’cause that’s what I do.